I have been making these Oreo Truffles since Derek and I first got married. They are SO EASY to whip up for a party or get together with friends or just to make a husband happy! (My husband’s favorite thing is Oreos) I made a batch of these for him to take to work earlier this week. The best part about this recipe…It only has 3 INGREDIENTS! For those that were wondering what kind of chocolate I used, here is a picture of mine. I used about half of the package. I followed the microwave instructions. I used a small but tall bal to dip them in so that the entire truffle could easily be covered and carefully lifted it out with a fork (you can use skewers as well) and tapped my fork on the side to let any excess chocolate drip off. It is ideal to cover them with chocolate right after they have sat in the freezer for at least 15 minutes. The cold helps the chocolate set up faster. These are awesome! Dumb question but how do you dip them in the melted chocolate? I used two forks. Its easiest when the balls are frozen, so if you're making a large batch don't take them all out at once. i think when i make these im going to try using toothpicks. stick a toothpick in each ball before you freeze it then dip! actually, it almost always works much better if you poke the toothpick in after the balls are frozen so they're "tighter" otherwise the melted dipping chocolate is warm enough to make it slide right off....just did it both ways last night cause it'd been a few years since I made them. I then stack a couple Styrofoam plates or bowls and poke them in so they dry undisturbed. I totally vote for Nestle white chips...they dry quick and taste way way better than almond bark or hersheys chips! Oreo truffles have been an all time fave since brought into my world about 10 years ago and well, I can't be in the room with them and not eat them...unless they're bright white(then I know they're Hershey's or almond bark and just not as good...sorry. The peanut butter balls sound amazing! Do you have the recipe for that? I love this one! I used 8 oz. the first time I made them and agree that it's easier to use less! Totally PINNED to make these as part of my holiday cookie platters! Yum!!! Definitely want to try these! My hubby loves oreos too! and i am glad u made another post...these look awesome !!! i used to make the oreo brownies for the holidays and all of my 40 neices and nephews loved them, but wait till they get their hands on these..gf..quick i need to write down this recipe..
p.s..are you using white chocalate for coating? I was confused at first when I read the recipe because the white was on the outside. And I assumed that was the cream cheese. @sabri Yes, I used white chocolate for my coating, but you could also use milk chocolate too if you wanted! I have had them both ways and both taste amazing! @sabri You could definitely use almond bark too! @Jenny @ Simcoe Street That is not a dumb question at all! I just plopped the chilled Oreo ball into the bowl of white chocolate and turned it carefully with my spoon and spooned on chocolate until it was covered. Then I carefully scooped it out on top of a fork and and tapped the fork on the side of the bowl to help remove any excess chocolate then put it onto wax paper. I have also skewered it and dipped it in then tapped the skewer on the side of the bowl to remove excess chocolate as well. There are probably better ways but I am all about quick and fast! haha! I hope that helps! Let me know if you have any more questions! WOW. I NEED to make these. My husband loves Oreos too. I think we would all love these at my house. Visiting via TJ. Holy cow! These look devine! I'm definitely printing these out to make, the kids will LOVE them! I just made these, and I think I used too thick of White Chocolate (Ghiradelli), because coating them was a chore, but they still taste FANTASTIC! I first had these this fall-so amazing and really taste like gourmet! thanks for posting the recipe! These sound delicious and look so pretty! Keeper! woah. i LOVE oreos. I'm sure I'd eat the entire batch. not the best move for my backside. Love oreo truffles, yours are beautiful! you can also use nutter butter cookies for a peanut butter taste. Just to be sure, they need to be refrigerated, right? I'm looking for recipes for cookies to send to soldiers. What kind of dipping chocolate do you use?? Looks yummy! How many can you make with this recipe? If u use regular Oreos instead of double stuff u generally need more cream cheese. :) but with that extra cream cheese in the double stuff ones u can get by with less. Love these!!!! @Anonymous Yes they do need to be covered and refrigerated after making (If not devoured right away :) )@Anonymous I used a white almond bark melting chocolate. I'll update with a picture when I return back home after the holidays@Anonymous They make quite a few. I would say about 20, give or take depending on the size you make them. I'll be featuring you in an hour or so... Thank you so much for sharing! I "liked" Nambe on Facebook. The only problem I had was dipping them in chocolate. It's hard to cover the entire thing with chocolate. I tried using my fingers but that didn't work out so well. Next I used toothpicks, but it was still hard to get them completely covered. If I didn't do it fast enough the oreo ball would just fall apart even after being in the freezer. Even though they weren't as pretty as these they were still pretty darn delicious! I add 2 tablespoons of peanut butter or raspberry preserves for variety. These are really yummy, but has anyone tried the Mint Oreo's for this? I have not made these but a co-worker made them with regular and mint oreos. They are fabulous with both! I just tried this recipe and i was dissapointed. They did not come out as good as the picture looks. Will not be making again. These are the bomb! Easy and delicious, can life get any better! I use toothpicks to dip mine. After I roll them into a ball I stick a toothpick in the top, then put them in the freezer. After dipping gently pull the toothpick out and you have perfectly dipped balls for the nice look. For Christmas I top with crushed candy cane. Enjoy! I love these things they r really addictive we r going to make them for our baking this weekend I can't wait!!! Just made these! They are DELICIOUS! And so easy. Thanks for the recipe!! Everything looks so good I don't know what I want to try first. I have printed several of your receipes to try. You can use all the different flavors of the oreos, like mint... to make different flavored truffles. I made these today, so easy and really good! Just made these - I used 2 packs of regular Oreos (crushed), reserved 1 cup for topping, 1.5 8 oz. packs of cream cheese, & 1.5 boxes of Baker's white chocolate bars melted. Made about 55 truffles, but the white chocolate was way too thick & sugary to completely coat each truffle IMHO (my sweet tooth husband requested less white choc). So I ended up drizzling, which was way faster & easier, & they're a huge hit! So overwhelming were the positive replies, yet, I am with the few who found the chocolate chunky and cumbersome-not looking at all like the picture; it was a huge chore to cover the cookies. Is there something I am doing wrong? I noticed nobody really addressed this issue. I used a double broiler to melt-yet it was sticky? @Anonymous I am sorry you had trouble with the dipping chocolate. I have included a picture of the kind I used as well as some tips to hopefully help them turn out better. Let me know if you have any more questions! I would love to help in any way I can! @Anonymous yep! You just throw the whole oreo into a food processor (or a zip lock bag and smash with a rolling pin) and grind it up real fine! Let me know how they turn out for you! I made these with mint oreos! They are SO good! I think I know what 3 ingredients I will be grabbing at the store. These sound delicious. Ive been making these for years! i was so happy to see this on here..You can also use food coloring to color almond bark. ie: pink or blue for baby showers or green and red for christmas.. I use CANDI-QUIK (Walmart), and I add crushed candy canes to the melted chocolate...Dee-lish!! You rock! These are so good. I only hope I can not eat them all and actually give them to my neighbors for Christmas. I will for sure make them again .. and again .. and again ;) Thank you and Merry Christmas! I'm just curious if you have to use a food processor to crush them or do you think it can be done with your hands? I don't have a food processor. A friend of my made some and I fell in love right away!! I'm going to try and make some of my own this week!!! Thank you so much!!! Merry Christmas and Happy New Year! I made these today...I used 8 oz. cream cheese, will try less next time. I used a metal skewer to dip the frozen balls into the chocolate bark but when I tried to release the skewer it took some of the icing with it. I was glad I had crushed Oreos and candy cane to cover the hole. I should have read the comments before making...next time I will try to the toothpick method. They really do taste like truffles. These are delicious! The chocolate part is a little too sweet, but I think if you just drizzled it over the top like someone else commented it will be less overwhelming.I freezered these for 15 minutes like you said and just dropped the entire ball in the melted almond bark, then scooped it up with a fork and they turned out perfectly! i made these tonight for Christmas eve. They look so good!! I used corn on the cob stickers to help me dip them in the chocolate. It really helped! These look quick and easy. Plan to make them in the morning! Do you have any problems with the coating cracking? I've made a few batches and can't seem to avoid it. Any secrets would be appreciated! Thanks! This is a great recipe! Thanks for sharing! I used milk chocolate and white chocolate and added 1-2 tablespoons of vegetable oil to thin the chocolate. Doesn't change the flavor at all. My daughter has made these, so delicious! Do you use white chocolate? do you process the cream in the middle too? you use the white almond bark or just white chocolate chips are good too! you didnt make that very clear! I just made these and followed your recipe exactly. They are so delicious!!!!! I used Nestle white chocolate and it worked perfectly. Yumm! Easy, Awesome and looks much harder then it is. Straws inserted in them to give as "Lollipops" are good too. I am new to this, so I don't know what to put where it say's select profile. I just finished making these and they turned out great!!!! Can i leave these in the fridge over night already with the chocolate? My bff made these for x-mas exchange. They are awesome! I just made these for a friend's birthday. They are so yummy and SO easy! Thanks! These look amazing! I want to make them for the super bowl!! When I make these, I put a toothpick in each one before freezing. I made these for super bowl and it was a hit!!! Everyone LOVED it!!! Thanks for sharing! Made these tonight for my family! Totally awesome!!! Thanks! I just put them in the chocolate and use a fork to lift them out. 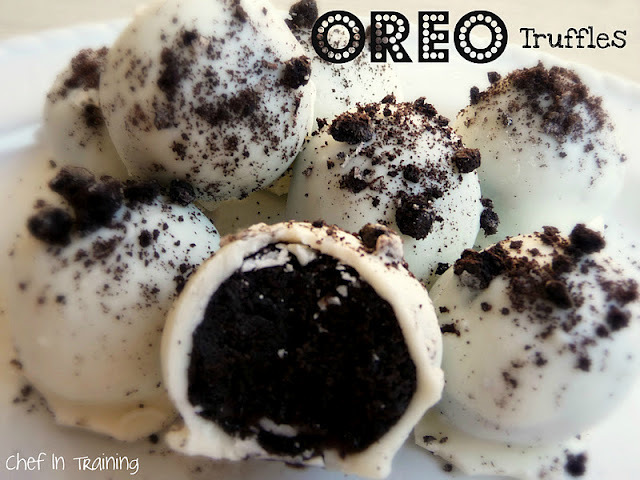 I have made these with the mint oreos and the peanut butter oreos...........sooo good. The mint ones remind me of girl scout cookies. Will this work if you just add the cream cheese to the food processor after the oreos are crushed? or do you need to mix it by hand? Stupid question, but do you use cream cheese or cream cheese frosting? I made these for a slient auction bake sale to benefit a local pet rescue group and they went for $27 for a dozen!!! Followed your exact recipe.. very delicious. I also inserted toothpicks before putting in the freezer and dipped fine in the chocolate. They are very delicious, however getting the cream cheese & crumbled oreos mixed together was a huge mess. Suggestions??? Also how soft for the cream cheese?? I bet these would be good by double dipping? Put in White Chocolate, refrigerate and then in Milk Chocoalte!! !YUM...What do you think? I know. They are really good, you should try them! Is there something else you can use instead of cream cheese? Like frosting? Sorry not a fan of cream cheese. Do you think if I was to get a second box of the double stuff oreos if I was to scrape out the filling from the cookies and heat that up instead of chocolate that it would cover the truffles like the chocolate would with the same coverage and consistancy? I want to do this for my girlfriends baby shower on Sunday and die the oreo filling I would be melting blue because she is having a boy. Thoughts? They look so good, do have a question tho, I would assume you use the whole cookie, meaning the cream inside, and then cream cheese too, but in the picture you don't see any white really, thinking maybe it turns dark from the black cookie or is it I just can't see it in this picture? They do turn out mostly black inside from crushing them up really well. I just made them tonight for the first time. I used milk chocolate chips as the chocolate coating and they are to die for! What a great recipe! Make these even better... add crushed candy canes or starlight mints to it! To die for at Christmas time! What happens if you don't have a food processor? Your chocolate was too hot. Try a double broiler. If you don't have one then use an electric skillet put water in it. Place a glass bowl in the center. Place your chocolate in the glass bowl keep the heat on low just enough to melt the chocolate. You can put them in a ziplock bag and seal it up then roll and crush them with a rolling pin. That is what I did before a food processor. Yes the dark cookie turns them black after being finely crushed and combined. It really isn't chocolate at all if you read the package front ...no where does it say chocolate. It is Almond bark...a candy coating. If you do want chocolate you have to buy the chocolate chips. I really don't know if there is a real white chocolate. Cocoa is brown and that is where chocolate comes from. The Cocoa bean. I just finished making these and they are delicious!! Made these tonight with the mint oreos...delish!! I ate way too many! made these for a shower-turned out perfectly!!! a big hit! i'm making them again this weekend for a housewarming do you thinking making them on thursday night they'll still be good for Saturday afternoon? I am making these today, they're in the freezer. I'm using "Candy-Melts" in vanilla for the coating. Can't wait to see how they turn out. okay...reporting back! OMG!! these things are absolutely delicious. The "Candy Melts" worked perfectly. I gave one to me husband after the first couple had set up...he was speechless and then started to moan...lol....we are four for four with recipes from your site! Thankyou so much for sharing all these wonderful things with us! I Live in Scotland and can't get double stuff oreos. will regular Oreos work? I used regular oreos and about 6 oz of cream cheese and they were a big hit at my dads birthday! Soooo yummy! I just made these and they are great!! !I also posted about your Blog on Harold Jaffe Jewelers facebook page...thank you for the inspiration!!! These look amazing! Looking forward to making them for an upcoming event. Question....can I make the Oreo Cookie balls ahead and freeze them for a couple of weeks. Thanks! No they don't! They are really good! If you make them, let me know how they turned out for you! Thanks so much for posting this delicious and easy recipe! cup of the oreo mixture for garnishing the tops of the truffles. YUM!!! love the truffles almost like cake balls delicious great for parties thank you so much for sharing. My husband is deployed in afganistan and loves oreo's I was thinking about making these for him to send in a care package. It is summertime there do you think that the chocolate on the outside would melt? I don't want to send it to him all melted. I made these today, but changed recipe by forming Oreo mixture around a drained maraschino cherry. Delish! Forming around a maraschino cherry sounds 'slap your momma' delish!! I'm also thinking of either less cream cheese or less Oreo center to cut the sweetness just a tad. Just wanted to say I love these truffles! This is my second time making them and this time it's for adult party favors for my 2 year old son's "bubble" themed party this weekend. I used the pastel candy melts instead of chocolate or almond bark and I didn't garnish them so they look like little pastel bubbles in clear favor bags. So cute!! Thanks for sharing this awesome recipe! I just made them and they came out just awesome!! Thank you somuch for the great recipe! I froze them before dipping them in chocolate what made it a lot easier. And of course they taste super yummy too! definitely gonna try making these..they look really nice! How'd you get the melted chocolate in the center as filling? Wow these look amazingly delicious! Will definitely be trying 'em out! This just gave me the best idea for Thanksgiving dessert treats!! Awesome. I used two forks and that did the job, they don't look as good as yours but practice makes perfect. Also can't find double stuffed Oreos but standard ones did the trick. 1package regular Oreos and 6 Ozs of cream cheese. And try flavored Oreos. They good too. I do these for tons of pol all the time. hi my name is Diana i love to make desserts i may not be really good at it but i keep on trying. i love cookies especially oreo's my favorite. this recipe looks sooo good. THANK YOU so much for this amazing recipe! Made them for a cookie exchange yesterday and they were a huge hit! Very easy to whip together (appreciate they are no bake) and taste absolutely scrumptious! Look forward to visiting your site often! Happy Holidays to you! Can you use lite cream cheese or neufchatel?? I tried these this weekend for a cookie swap party I went to and the name ought to be 'Dissapearing Oreo Truffles'! They were wonderful! Just to clarify, I used the Chocolate Bark candy coating. I found this recipe on pinterest and plan on making two versions: one with the doublestuf oreos and a dark chocolate coating; and a lemon oreo with white chocolate coating. My questions are about storing: how long can you store them and should they be kept cool? This is such an easy recipe and always a hit. My friends and co-workers curse me for making it, but can never eat just one. definately going to try this for tomorrows surprise bday party for a good friend of mine! they look sooo delish! Just made these today! Needed a last minute "treat" recipe and it worked perfectly! A helpful hint for us Canadian's: the Western Family candy coating used in this recipe is only sold in the US, so I just used Hershey's White Chocolate Chipits (melted them in the microwave) and it worked just fine. Thanks for posting! Is it okay to use regular Oreos instead of double stuff? Yes, definitely! You will just need a little more cream cheese. We are redoing this now as I write. Do you think you could freeze these? How long? We are baking a lot of our sweets for our wedding and would love these! I make these every year for christmas. Love them, except I take a fun "naughty turn" and usually use milk chocolate bark, then I give them as gifts and call them "reindeer poop". I love using things like mint oreos too. Tons of different flavors depending which oreo you use. Our art teacher makes these and we call them Mr. O's chocolate balls! What do you do with the white cream double stuff in the middle, do you, crush it too?? Van you freeze the balls ahead.. negorr dipping them.. like a few days?? About how many balls does this make? do you use the whole oreo or without the creme? can i replace the cream cheese with non fat yogurt? I have made these with nutter butter as well my hubs love these!!! Kinda dumb question, but do i have to take away the cream that's between the oreas? Just to ask. When using preocessor to chop the oreos, do i have to take out the cream that's between the biscuit or just put it altogether in the processor? How many truffles does this make approx? where can I find the bark in Australia?? do you have to use cream cheese in this recipe or can you use a different substitute. how many truffles does it make in one batch? I make a non dairy version due to husband and son having dairy allergy. Use soy cream cheese and dark chocolate (check ingredients of dark chocolate some still contain dairy). They are still delicious!!!! Do u take the double stuff frosting out of the oreos b4 u chop up ? Is there anything that could be used in place of the cream cheese? Do the truffles need to be refrigerated once the almond bark has set up? I would like to make these for a cookie exchange and the cookies would be set out for the school day! Thanks! Because there is cream cheese, do you need to keep them in the fridge after making them? Sounds delish! No sugar is needed in the cream cheese? I know it's bitter by itself...the oreo cookies make the cream cheese sweet enough without the mixture being bitter? I also use Nutter Butter cookies in stead of Oreos it's also good. You can put raspberry extract or orange extract in it to, when I do use extract I mix it with the cream cheese, it doesn't work when you mix it with almond bark. These look delicious and I would like to include them in my Christmas baking. I wondered if they can be frozen if made ahead of time. Thank you for the recipe and I look forward to hearing from you. Merry Christmas to you and yours. This sounds so good and easy to make. Can you tell me about how much choc to use if its not in bar form? Cup wise. What if you cannot get the Chocolate that you have suggested< what the next best? 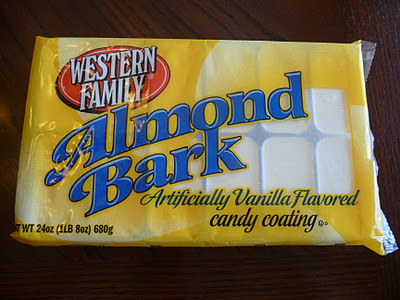 Where can almond bark be bought...or can you use semi sweet chocolate? Do you have a substitute suggestion for the cream cheese for those who can't use dairy? This is one of my favorite desserts to make for a party. The only thing I do different is I use milk chocolate. I also melted semi sweet chocolate to drizzle across these! Turned out gorgeous! How long will they last or can you freeze them? How many does this make approximately? PERFECT recipe! to get rid of that major chocolate craving, i suggest dipping the Oreo-balls into melted milk chocolate! How much oreos do you use exactly? What type of package? What if you don't use double stuffed oreos? -what do you think chocolate cream cheese would be like?? How many does this make, and how many bags of the Almond Bark were used, also have you tried using other melting chocolates with success? The almond bark is pricey. Thanks. How many does one batch yield? i am confused....it says dipping chocolate? That is vanilla almond bark you have pictured and not chocolate? How many servings does this call for??? Do they need to stay refrigerated after making them?? yes, I always store in an airtight container if I'm not eating them right away :) They can also be frozen in an airtight container as well! How many Oreo truffles does this recipe make? Thanks for this recipe! I made it for Christmas and it was extremely easy and yummy. I did not use a food processor but instead pounded the cookies and it still worked perfectly. ( and less clean up bc I threw away the plastic bag). I also used birthday cake Oreos and topped them with rainbow sprinkles. I want to try mint Oreos and maybe dye the chocolate green. Or coconut Oreos with coconut on top would be good snowballs. With all the different types of Oreos there are a lot of options. I will seek out almond bark next time. The white chocolate coated the ball very thickly and I had to use a lot! I noticed what kind of chocolate that you used, but I can only seem to find the Baker's brand white baking chocolate. Will this work? I have never worked with dipping/melting chocolate before. I am just curious to see if the baking chocolate will harden. Thanks. I made these for the holidays and while they were good, they weren't what I expected. They were like mud, and never had that cake-like texture that I had tasted before. I thought I did something wrong, so I made them again, but they came out the exact same way. We had a Christmas party, and while talking to one of the guests, I was told that I should have used regular Oreos, not double stuffed! I went back on line and saw that every other recipe out there called for regular Oreos...except this one. People ate them, and they were tasty, but they were more like fudge. On a good note, the Almond Bark worked well, and was very inexpensive. How many days can these keep? Do they need to be refrigerated after dipping? Thanks! Can I use something other than cream cheese? Wow this looks amazing! I can't wait to try it out. I typically tend to ruin dessert recipes but this one appears to be so easy (and the less ingredients - the better!). Thanks for sharing, xoxo. Hello! I am very bold and adventurous even when it comes to food. I've made dishes for the first time at the time of the celebration and thank God, they always turn out right. So, this is the same case on this dessert. Can you please tell me how many servings would this recipe make? Or on your estimate, for how many people would this recipe be? I would greatly appreciate your quick reply as I was only informed to make a dessert for tomorrow. Help please! Thank you very much! Can I make this without a shell? It won't be as pretty, but would it hold? Maybe I roll it in powdered sugar? oreos biscuit are double stuffed. oreos right? melt chocolate according to directions, what direction either i may have overlooked them or i didnt understand, they look so delicious, and im going to try to make them for a small project, plese reply as soon as possible, thank you! I saw this post on pinterest, and I just had to try it. Although, mine didn't turned out like yours. When I mixed the cream cheese with crushed oreos, it became really soft and almost impossible to roll them into balls. Any tips for that? I'm from Europe, so maybe it has to do with the consistency of the cream cheese (??). Made with 4oz cream cheese; probably would have been better with 6oz. The chocolate coating (Candy Melts from Wilton this time) hardens fast! Can only do 3-5 truffles per heating of the coating. Heated up my candy melts in a mug so it would be narrow and deep for the truffle. Poked each frozen truffle with a toothpick and then dipped and twirled it in the coating. Sprinkled with various colored sprinkles for Easter. i have been making that's for several years and they are really good with a dark chocolate coating to play off the sweetness of the Oreos. Also, I use my KitchenAid stand mixer with the batter paddle to mix the cream cheese and Oreos. I used to mix by hand, but stand mixer is MUCH easier. I tried these and they are amazing and you can also make these with different cookies too!!! can you use just white chocolate for dipping? would that make the flavor any different? also, do they have to be kept refrigerated? and can they be frozen? Can these be frozen? I am making for the holidays and trying to figure the best way to store them, since they won't be consumed for a couple of weeks. Loves this recipe....since it has cream cheese in it do u need to refridgate once they are done? Could I use the instant freezing Magic Shell instead of almond bark? no it won't harden the same way. I would not recommend that. can you use spreadable cream cheese? THANK you for mentioning that Almond Bark is your favorite because it sets up quicker and doesn't melt as quickly. This especially helped me when I used Almond Bark for garden parties desserts! Thanks again!